This is sort of covered in my portfolio but actually it makes rather a nice, in my opinion, story for a blog post. It is about web development but it also has to do with how interesting and diverse life can be if you let it. In the spring of 2010 I was cycling north through the baking hot, barren deserts of northern Argentina. As a consequence of being there I made the acquaintance of another cyclist.. an English chap, David, who had made his home in southeast Asia. The reasons for our meeting are as far from anything to do with web development as you can imagine.. I was pondering a choice of route either over the high (4700m) Paso San Francisco into the Atacama desert of Chile and hence north into Bolivia that way, or to continue north in Argentina and cross the border into Bolivia at the La Quiaca - Villazon border post. In the event I decided I was keen to enjoy a few days off and some cold beers in Salta so I kept going north in Argentina. It was super... I digress however... through subsequent conversations I discovered that David had been working as a guide for a large cycling holiday operator and had become somewhat disillusioned with the way those tours were run, and instead was keen to start a business of his own that would allow him to run some thoughtfully designed, small group tours exploring the lesser-touristed backroads of his favourite part of the world - Southeast Asia. All that was missing was something of a catalyst.. and our meeting turned out to be that catalyst. On my return to the UK we put our heads together and made a business. After much head-scratching we called it Painted Roads Cycling... it seemed appropriate.. "colourful cycling tours". I got my paintbrush out and scribbled a rough logo that has endured to this day, put together a business plan, a simple website to get things off the ground, and some brochures... and that was it.. it just happened and all worked out brilliantly. Having helped to get the business off the ground I took a step back to pursue the business that is mikesimagination.net, and now, 6 years later Painted Roads has matured into a rather lovely little business with a reputation for personal service and a portfolio of really special tours. Back in the summer of 2016 David asked me if I could build him a new website that could support a whole bunch of features he wanted and that would give his customers, both new and loyal existing customers, the best possible experience and that could differentiate him from the large, corporate cycling tour operators. So I did. It's here: http://www.paintedroads.com It's built using my modular CMS and hence can integrate new features and functionality effortlessly. I've just finished building a new module for creating promotions with landing pages and that can issue user-specific discount vouchers for different campaigns. It didn't take long and hence has worked out stacks cheaper than using a subscription service for creating promo landing pages as many businesses do. The CMS is also highly optimised for search engines so despite Painted Roads being only a very small business in Google searches we've been able to get it to rank alongside the large, industry leading tour operators with very little effort for a range of key queries. Enough rambling from me.. I thought I would write it up as one of the things I enjoy most about what I do these days is the sheer diversity of businesses and individuals I've been able to develop long term relationships with, and to be in a position to use my skills to make a real difference to those businesses. As the owner of Painted Roads Cycling I am delighted with Mike's work. The new website is not only beautiful from the outside, it's simple and efficient behind the scenes, and Mike is always happy to go the extra mile to make things work just so. And the real beauty is, my input was minimal, all I needed say was "time for a new website Mike", and this is what appeared! Here's something a little bit different that I was asked to build earlier this year. A fish and chip restaurant in Sweden got in touch and asked me if I could build a digital menu display system for them. There are a number of commercial systems available, some based on a cloud-subscription model and some as standalone systems to purchase, but the prices were found to be eyewatering so the brief was "could I build something affordable that would support an unlimited number of menus and that could be displayed on standard HD TVs". Of course I could....! The restaurant needed a minimum of four screens all displaying different menus and as the menus and catch change between lunch and dinner they had to be easy to edit and schedule. This version is cloud based but could just as easily be hosted on a local system, a laptop with a suitable display adapter would make it terrific for festivals and events as well as fixed installations - I have some ideas in that respect that I'm working on so stay tuned for that. The system is going to be available from me as an "off the shelf" product. Do get in touch if you'd like to know more. Use low cost HD TVs. Display as many as required at a time, limited only by whatever display driver you have available, or dispense with that altogether and use smart TVs. Menus can be edited "in situ" - i.e editing is done in the final display context so you can always see how the menu is going to look. Multiple templates - eg full width, menu with sidebar, complex footer, simple footer etc etc for maximum versatility in advertising, promotions etc. Full rich text editing capability - i.e text formatting, insert pictures and so on. The graphic design for this one was done by the very talented Foxcub Studio. An example menu with a sidebar and 3 column footer. Note that for the purposes of this blog and my primary readership I created a demo menu in English..
Editor View with floating formatting toolbar visible. Menus can also be edited in full screen mode. Full width menu template under development. Some sort of mid-North Sea dialect I think..
Another highly rewarding project that launched recently. I've written about it in much more detail in the portfolio here, so for the purposes of this blog post here's a quick summary. Built for Banshee Bikes New Zealand this instance of the mikesimagination.net custom bicycle builder / web configurator application represents the ultimate evolution of the application. 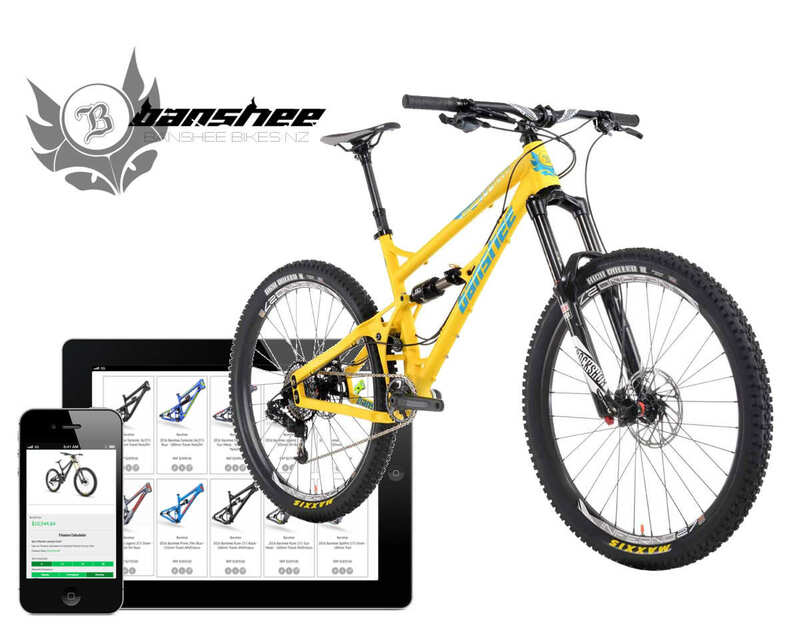 Able to cope with the multiple standards and component compatibility problems that exist within the cycling world - it permits the admin to define relationships between components and categories at multiple levels - within categories, within sets of categories or globally. From the point of view of the end user the path through the configurator is completely unrestricted with all products/components available at once with compatibility being calculated on the fly as the user makes selections. Completed builds can be saved, shared on social media, printed and financed - a finance calculator is included that permits the user to create their own flexible finance package before being forwarded on to complete their application.